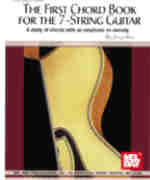 This book offers a great starting point for the 6-string guitarist who is adapting to the 7-string guitar with the seventh string tuned to A, one octave below the fifth string. Readers will gain insight to the chord conversion process as the proceed through the book. Major, minor, and dominant 7th chords are addressed.